Members: Click the 'Buy' button and log in to reserve your FREE ticket(s). 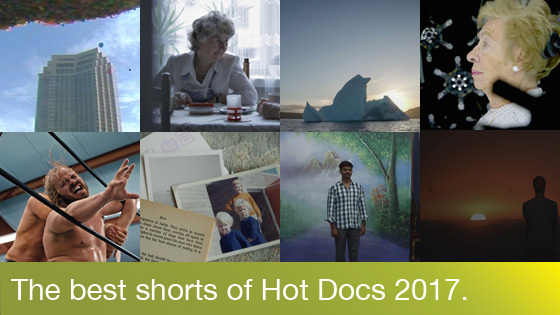 Join us for an exclusive member-only screening featuring eight of the best short films from Hot Docs 2017. Short films are some of the finest docs we screen at the festival each year and we've selected our favourites for you in this special program featuring some unforgettable characters. Shane Smith, director of programming at Hot Docs, will participate in a post-screening Q&A. Filmmaker Charlie Lyne crafts a ridiculously charming and downright fishy story of myth, memory and ingenious marketing. A professional wrestler, Chace "Cauliflower" Brown brings a new perspective to the art and craft of wrestling. His musings about this oft-derided sport embrace interesting narratives that unfold between opponents in the ring and not on a page, elevating this sport to art. In 1986, the city of Cleveland released 1.5 million balloons to capture a world record and shed its nickname of the "Mistake by the Lake." But their inflated pride is quickly popped. The beauty and grandeur of the icebergs in Iceberg Alley, between Newfoundland and Labrador, are seen through the wistful eyes of residents and tourists. Bearing a special bond to the ancient and colossal structures, admirers share stories in deep awe of a sight they may never see the same way again. Patha, like many foreign workers in Singapore, makes the trip to a professional photo studio to have his portrait taken. It?s his golden ticket to securing a bride back home. But time is not on his side as his family races to find him a wife before his 32nd birthday. Though his marriage is arranged, there's still some thrill to this chase. Barbara and Zdzislaw's marriage has technically lasted 45 years. Despite spending the last eight years apart, they decide to host an anniversary lunch. For all their petty bickering over bills, furniture and their impending anniversary celebration, this couple does have a lasting and unbreakable love. A Syrian refugee reminisces about his life back home, speaking about the people, place and culture with a bittersweet and palpable sense of nostalgia as he responds to images of Syria projected on a wall. We travel with him to different parts of the country, as he talks about his initial reluctance to leave and challenges popular stereotypes of the country. Anne Frank's stepsister and Holocaust survivor Eva Schloss is the subject of an immersive interactive media project that seeks to preserve history and memory. By recording Eva's stories and experiences, future generations can learn from the horrors she saw and lived through.